Iranian-American Rafaty Named WTF’s New Sec. Gen.
CHELYABINSK, Russia (May 10, 2015) - The WTF Council today decided on the host cities of upcoming taekwondo championships and announced key appointments, including the organization’s new secretary general. Muju, Korea, beat out Turkey’s Samsun to host the 2017 World Taekwondo Championships, while American Hoss Rafaty was named the new secretary general of the WTF. The WTF Council also approved Mexico as the host country of the 2016 WTF World Junior Taekwondo Championships, and Lima, Peru as the host city of the 2016 WTF World Taekwondo Poomsae Championships. Iranian-American Rafaty was named the WTF’s new secretary general. A businessman based in Dallas, Texas, Rafaty has acted as chairman of the WTF Expansion Committee. A 3rd Dan black belt, Rafaty started his career in ITF taekwondo, leading WTF President Chungwon Choue to hope that he would enhance future cooperation between the ITF and WTF. “He is a good mediator and helps people come together,” Choue noted. Korean Yang Jin-bang was named director general of the WTF Seoul headquarters. Since 2013, Yang has headed the WTF Technical Committee, and brings to the role both practical and academic experience in taekwondo. “Given his academic background and management of spots organizations, the Seoul office will operate in the most effective way under his guidance,” Choue said. It was announced that the WTF’s headquarters, currently based south of Seoul, is going to move to the capital’s downtown, close to the presidential mansion and City Hall in early June. 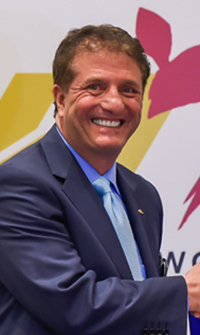 Frenchman Roger Piarulli was named director general of the WTF’s Lausanne headquarters. “This function is very important and Roger will be fully responsible for the operations of headquarters as he has been with me attending many different sports activities, “ Choue noted. He added that Piarulli has excellent relations with Francophone sports organizations. “We could call him a ‘linker’ between the WTF and many international federations,” Choue said. Korean Choi Chang-shin was named standing advisor to the WTF. As a former deputy minister of sports and culture of Korea, and as the ex-secretary general of the 2002 FIFA World Cup organizing committee, he offers widespread experience at the top end of international sports. After the new officers offered their thanks and pledged their best efforts, the agenda moved on to the hosting rights for upcoming championships. In the most competitive bid in years, the hosting rights for the 2017 World Taekwondo Championships were decided. The bid was between the Korean Taekwondo Association, which proposed Muju in Korea’s southwest, while the Turkish Taekwondo Federation proposed the Black Sea resort of Samsun. Voting was by blind ballot. The winner was announced by Choue. “The next 2017 World Championships will be Muju, Korea,” he said. As per WTF regulations, the number of votes was not announced. The winners were congratulated by the members of the Turkish delegation.